This is our final profile of first crop offerings at the upcoming Fasig-Tipton July Yearlings sale. Click here for a complete list of Fasig-Tipton July TrueNicks reports. 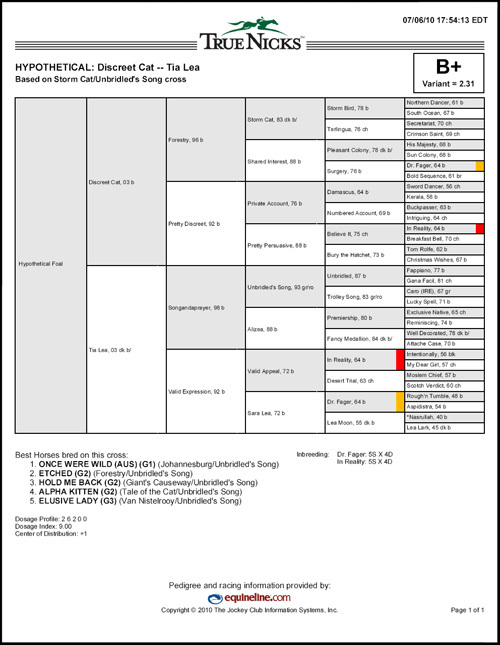 Generally he has been disappointing with Mr. Prospector but Discreet Cat’s sire, Forestry (TrueNicks,SRO), has found success with Champion sire Fappiano (he is a reverse cross to Forestry’s granddam), and Discreet Cat’s granddam is by Believe It, a three-quarters relative to Unbridled’s granddam. There is just a pile of the Tartan Farm/Genter combination of Rough’n Tumble and Aspidistra behind this pedigree in various combinations, and we do like the way this pedigree is put together. Click the thumbnail for a full-size TrueNicks report. The cross of leading sire Distorted Humor (TrueNicks,SRO) with mares by Relaunch and his sons is a good one, and there is already a graded-placed two-year-old from the first crop of Distorted Humor son Sharp Humor (TrueNicks,SRO) out of a mare by Tiznow (TrueNicks,SRO). Any Given Saturday (TrueNicks,SRO) is going to be particularly interesting with Relaunch as his third dam is a half sister to the granddam of Relaunch, so we like the way that this pedigree was put together. Additionally Any Given Saturday’s grandsire, Forty Niner, is a Raise a Native/Ribot cross, like Majestic Light, sire of the second dam of this yearling. Click the thumbnail for a full-size TrueNicks report. The mare, a sister to graded I winner Unfurl the Flag, is inbred 3 x 3 to Relaunch. You'd have to think that this might be interesting with Political Force (TrueNicks,SRO), whose pedigree features two daughters of In Reality, the sire of Relaunch. The real twist is that one of those daughters is Relaunch’s stakes winning sister Moon Glitter, the dam of Political Force’s own broodmare sire, Glitterman. Click the thumbnail for a full-size TrueNicks report.